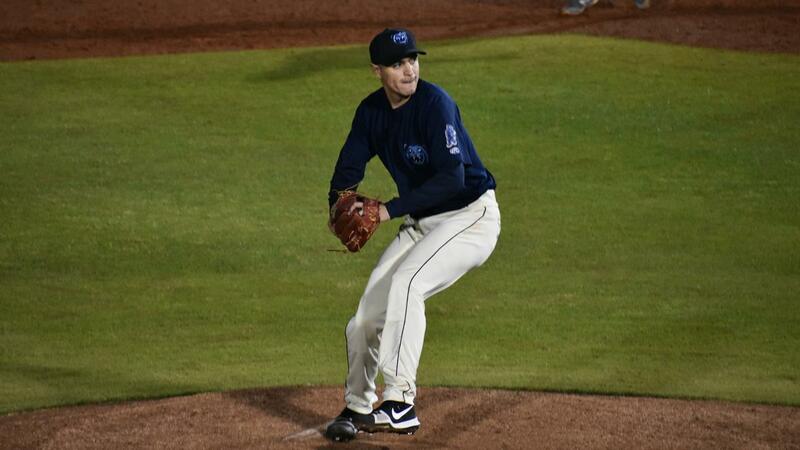 MOBILE, Ala. (April 8, 2019) - Adrian De Horta pitched an immaculate seventh inning for the Mobile BayBears, the Double-A affiliate of the Los Angeles Angels, in a 7-5 win over the Pensacola Blue Wahoos Monday night at Hank Aaron Stadium. De Horta needed just nine pitches to strike out Ernie De La Trinidad, Caleb Hamilton, and Jordan Gore in the top of the seventh. After putting away De La Trinidad on a pair of called strikes and a foul tip into the catcher's mitt, Hamilton whiffed on three straight pitches. Gore looked at a pair of strikes to begin his at-bat, and then De Horta capped off the immaculate inning with a swing and miss. The BayBears (2-3) plated six runs in the fourth inning to take the lead after falling behind 2-0 on an early Mitchell Kranson homer. Mobile sent 10 batters to the plate, scoring runs on hits from Brendon Sanger , Brandon Sandoval , Jack Kruger , and Jhoan Urena . Brandon Marsh also contributed with a bases-loaded walk. Zac Ryan (1-1) earned the win with 1 2/3 innings of scoreless relief early in the game. Adam Hofacket recorded the final two outs of the game to earn his first save. Hofacket entered after Hamilton hit a two-run homer for Pensacola (3-2) to trim the BayBears lead down to two. The BayBears begin a five-game road series against the Mississippi Braves Wednesday at 6:35 p.m. Right-handed pitcher Jesus Castillo (0-0, 6.00 ERA) is scheduled to make the start against southpaw Tucker Davidson (0-0, -.-- ERA) for the Braves. Live coverage can be seen on MiLB.tv (Braves feed, subscription required, promo code: BAYBEARS) and heard on MobileBayBears.com, the TuneIn app, and the MiLB First Pitch app., with the Countdown to First Pitch starting at 6:15 p.m. The BayBears return home next Monday and host a total of 70 home dates through Labor Day, September 2. The new BayBears Pass is available, featuring a general admission ticket to every BayBears game at Hank Aaron Stadium for only $19.97 per month. Season ticket packages and partial plans are also available, featuring a 7-game plan and a 12-game option to guarantee bobbleheads and receive tickets to select fireworks nights. Individual game tickets can be purchased online at MobileBayBears.com or by calling 251-572-BEAR (2327). The Mobile BayBears are the Double-A affiliate of the Los Angeles Angels and play their games at Hank Aaron Stadium in Mobile, Alabama. The BayBears were founded in 1997 and have won four Southern League titles in 1998, 2004, 2011, and 2012. Additionally, the 1998 and 2011 championship squads were named Minor League Team of the Year by Baseball America. More than 175 former BayBears have reached the Major League level, including All-Stars Max Scherzer, Paul Goldschmidt, Jake Peavy, Carlos Gonzalez, and Justin Upton. For more information on the Mobile BayBears and Hank Aaron Stadium, please visit MobileBayBears.com, call (251) 572-BEAR (2327), or contact Steve Goldberg via email at Steve@MobileBayBears.com.